An artisan bakery in Evanston Illinois, specializing in croissants, artisan breads, pastries, danish, cakes, cookies, donuts and pies. Man it's hot in Chi town! Gets to the point, the bakers are gasping for air, near the oven. I left last night, our walk in fridge had to be sixty degrees. We are very unfair to it. Jeremy Gouduas, member of Baking Team USA 2010, was here the middle of June. It was late, late, Saturday afternoon. He was here doing a practice run at Kendall College. He came to the bakery here, directly from the airport, to mix a few dough's for Sunday's practice run. He opened our walk-in, and said "That redefines a full walk in". At the last few minutes of the day yesterday, the day crew pushed about five racks of shaped sour doughs' in there, awaiting the oven, for Friday morning. The cooling capacity of that fridge, which is on the roof, was out matched. I was in San Fransisco last weekend. The baking team was practicing there. SFBI, San Fransisco Baking Institute, is a lot of things. It is a school, as well as home to TMB Baking Company. TMB is an equipment supplier. They also bake for their own retail store in the mission district of the city. I was very impressed, they sent a lot of stuff to that store, stacks and stacks of product. Nice product, very nice. Anyway, I'm talking to Michel there, about building a retarder, to hold our product for the next days bake. It will have the ability to have different temperatures, at different times, switching automatically. Sourdough is best, held at fifty two to fifty five degrees Fahrenheit. We could set the retarder to be cold, maybe thirty eight, at 5pm. Forty two, at 10pm, fifty two at 5am, etc. Bread handled that way is awesome! Flavour, texture, crust colour, crust consistency, it's the real deal. I'm gonna make it happen. Just gotta push around a piece of equipment, or two. In spite of the heat, we're holdin' our own here, business wise. Gonna be a busy, farmer's market weekend. Forecast is hot, but dry. Dry is all that matters. I was looking thru orders for the weekend, seems we have a lot of large celebration cakes this weekend. Not necessarily, in great numbers, but a lot of big ones. Oh well, won't be long now, pumpkin face cookies are just around the corner. Very comfortable outside this morning. 'Bout sixty six, at 4am. I drove here with the van windows open. Bein' right here on the lake helps loads. I pulled up and outside I could smell toasty wheat, as they were unloading baguettes from the oven. Residual flour burns quickly, on the hearth. It's an unmistakable, unmatched, aroma. Only smells like that a few times a day. Same when they are fryin' donuts, or baking cinnamon rolls. We took in a lot of fresh blueberries yesterday. We are making fresh blueberry croissants for the markets this weekend. We will fill them with cream cheese filling, and top 'em with fresh blueberries, prior to the bake. The ones we made for Wednesday's markets, were really pretty. Got big plans 'bout fresh blueberry coffee cakes, as well. We'll see how the day goes. They might get pushed until tomorrow. Everyday starts with good intentions. Quoting Vince Lombardi "Fatigue makes cowards of us all". Well, gotta get started upstairs. A lady is comin' from Oak Park, to pick up goods for a memorial service. Can't disappoint her. She claims "You're may favorite bakery". She's "Comin' early to beat the traffic". I answered the phone, when she called. I was just talking to one of the opening retail kids here, about her order. I mentioned to them that "I could tell, she was an older lady". I just realized, she's probably my age. Didn't get much sleep last night, turns out yesterday, we committed to being the lone bread bakery, participating in a "Green market" at Lollapalooza, in August. It will be us, Seedling fruit and Brunkow cheese, at a minimum, from the GCM. It's concerning, it's gonna be a lot of stuff. We're figuring on a lot of smaller bread items that people can eat with wine and cheese. The single reason we decided to do it, is because we have our Koenig machine that will divide and round three thousand pieces per hour. Needless to say, the markets yesterday, did very well. Truthfully the nicest day we've had this market season. It was perfect. We ran out a little early at both markets. I'm sure it's because I have forgotten how much can be sold when the weather cooperates. We have battled the weather more this market season, than any other, in the past. Hopefully the rain is behind us. Forecast for this weekend is in our favor, as well. I posted a picture of a cherry flan. Every trip to France, I can't get enough of the flan, all the boulangerie offer there. The funniest thing, no matter how many books I look at, it's difficult to find any info on the flan I'm speaking of. I've spoken to a number of French bakers, they are willing to talk about it, but I can't find anything in print, or on the internet. Seems every version I find is similar to our custard pie or bread pudding. Which I don't care for, it's to "Eggy". 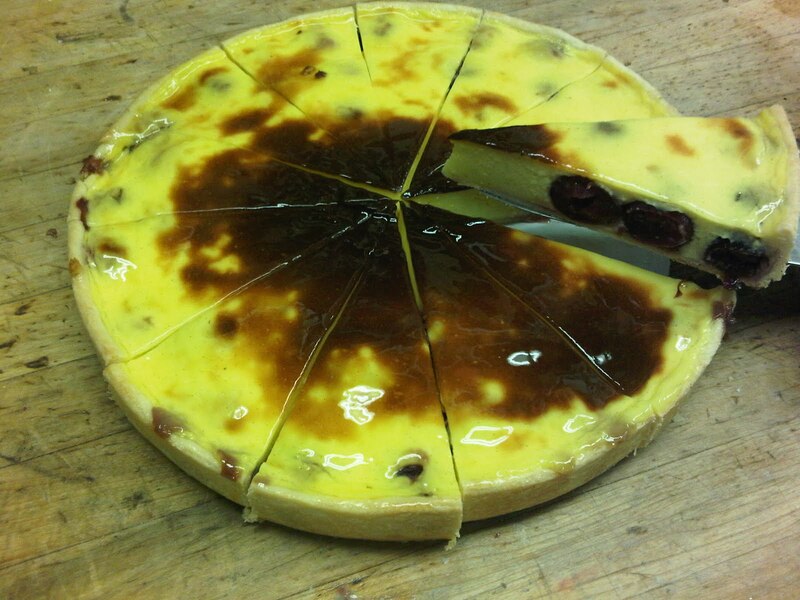 This flan is simply cooked pastry creme, spread into a pie pastry crust and baked in a hot oven to get that deep brown skin. We cool it overnight and glaze it with apricot glace the next morning and cut it. It has been doing very well. We use milk, sugar, custard powder, a blend of egg yolks and eggs, both organic vanilla bean and vanilla extract and butter. This is the first one we've done with fruit in it. Not sure how well you can see, it but it has pitted Washington state cherries in it. I'm glad to see it worked out. Opens the door to trying many other things. Next is gonna be lemon flavoured custard with fresh blueberries. Oh, by the way, delicious! I'm runnin' out of reasons to travel to France. Gotta get upstairs, and get to it. Should be a good weekend, Fourth of July sales, have been doing better, year after year. Last year it fell on a Saturday, we were open. Probably should've opened Sunday and closed Monday this year. Next Tuesday morning, we'll see if I made a good call or not. It has been nearly a month since my last post. We started the Glenwood Sunday market, June 6th and it has been non-stop since. The first day we were out of goods at 10:20. Second Sunday we made it to a little after 11. The third Sunday, 12:20. Yesterday we loaded up, and there was a sunami at 9am. Same starting time as the market. It rained for about thirty minutes, hard. Sideways rain. Like Forest Gump said "Rained so hard, it was rainin' up". I've spoke before of the issues that crusty bread has with the rain, not a pretty sight. We still sold over half of what we sent there. We sent our first truck in the morning, and it was my duty to take the second truck around 10am. I headed that way, knowing that they really weren't going to need the goods I had with me. The market was pretty much empty, 'cept a few die hards. One lady said "I finally get to taste your goods, there isn't any line this week". Last Monday I was in our store fetching a cup of coffee. A fellow was waiting for his turn and he was holding a little girl, maybe two years old. He asked me "Do you have any California bread today". I said "We typically don't put that in our store on Monday's". He explained that he bought one at the Glenwood Sunday market. Him and his wife finished it in one day, and he had to have more. I replied "Sorry, we can have it for you tomorrow". He placed an order and off he went. Upon my return to the office, I saw a loaf of day old raisin fennel and flax seed rye, in the day old pile. I grabbed 'em and I pretty much chased him down the street. Turned out he was carrying a six pack of cupcakes. He was very pleased with what I offered him. I assured him the loaves were day old, and "I was hoping they would get him thru the night". I doubt that would happen at a supermarket bakery. I don't know if he was a "First timer", here at the bakery. The fact that he found his way here, really left me with a good feeling. The Glenwood market has been doing incredible. The lady who runs the market told me "There hasn't been a bakery in this neighborhood for thirty years. Davidson's used to have a store on Morse ave". More support of my belief, the world is starving for quality bakery goods. Since Father's day, things have slowed down considerably, in our store. The campus is empty, and it was miserably hot/humid last week. Father's day weekend was very, very busy. It was NU graduation, so the town was full. Restaurants and hotels were full. Bat 17 and Bistro Bordeaux were doubling their orders, for four days straight. Speaking of Bistro Bordeaux, I had a chance to eat there. Really nice, nice menu, delicious food. They buy our bread and then they serve it in a brown paper bag, stamped with the name of a bakery in Bordeaux. Upset me at first. I asked "Is this bread really from Bordeaux"? The waitress fessed up with the truth, "No, it comes from Bennison's". We purchased whatever it is we need to make Italian sodas. We have a gadget that turns tap water into seltzer water, we add Torani flavoured syrup, and pour over ice. I gotta say, it's pretty tasty stuff. I guess we will start offering French sodas, as well. They are the same thing only with some form of dairy added. Hey gotta get back to it. I have jam on the stove. We pitted a load of sweet cherries, added fresh blackberries, strawberries, raspberries and blueberries. The stuff smells amazing. Gonna have to wait until Wednesday to taste it. 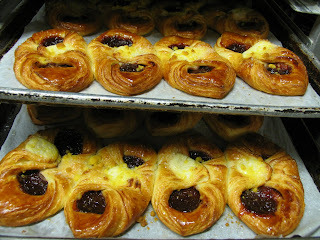 We are planning on using it to top our danish pastries that go to market that day. Been chasin' since my return from California. I came in Monday,Memorial Day, we were closed. Phones rang all morning. We should have been open. I mixed for nearly three hours, used five bags of flour. I had to make all the dough's that sit overnight, feed the levains, and set all the soakers, that were needed for market production on Tuesday. I also missed three days macaron production, so I'm startin' to feel that now. We had a killer macaron day yesterday, sales wise. I drove to work on Wednesday morning, needing the wipers, to get here. We loaded the trucks in the rain, but by time the market opened, it had stopped. In fact, it was pretty nice, sun was out. Last Saturday morning I got a text message from the GCM. "We're out of brioche, pretzel rolls, rhubarb danish, croissants and scones". It was 10:15 or so. Got another one at 11:20, "We're out". Yesterday morning, we went to load the truck, opened one of the metal boxes we use to transport sheet pans, and there were five pans of danish, still in there from Saturday. These boxes I speak of, are pretty big. they hold maybe eight sheet pans. When they are full of product, they are difficult to handle by onesself. So what that means is, Saturday morning, the truck was loaded, driven to the market. The boxes were taken off the truck. Four market kids walked around the boxes all morning. They told customers over and over, "Sorry we're sold out of Danish pastries". The boxes were put back in the truck, driven back to Evanston, put back in the basement. Taken out of the basement, put back in the truck. The box was opened, four days later, discovered and emptied. Neglect, carelessness, stupidity? How do those things happen? I'm comfortable it happens to every business, regardless of industry. I haven't told my dad. If my mother were alive, that would have killed her. I learned and have resolved to a simple belief, "If I'm not willing to accept what goes on here while I'm away, then I shouldn't leave". I think about what it cost the bakery, finding this ridiculous mistake, my daughter's graduation was worth it. In spite of this gaff, we've been struggling to get enough product to this market. Tuesday night we bought a new van. We've been using two, but the older one has two hundred thousand miles on it, can't be long for this world. With a third vehicle, we're gonna find out just how much we can sell at GCM on Saturday's. That new, nananutterchoco loaf, came out nice. Really tasty stuff. May have been a little salty. Stands to reason that some peanut butter will be saltier than others. It's no secret, producers around the world want to sell as much salt as possible. We sold it all. I baked it last Thursday, we sold it all over the weekend. Plan on making more today. Nananutter, pound cake and lemon poppy seed loaf, all today.As well as a few mixes of macarons. Gotta get upstairs, I'd like to get home before the street lights come on. Not only are the Evanston/Wilmette/GCM markets rollin', we start the Glenwood/Rogers Park market on Sunday. The weather is on our side, currently. Yesterday was very nice, Saturday is looking even better. Yesterday, I had to take Patti to Midway airport, down on the south side of the city. On my way back north, I stopped at the GCM, they were doing well. They had a constant stream of customers. I stopped to pick up, baker at the market, Joe. He was there to face his, laminated product followers, and it pleased him very much. Upon a customer asking for a croissant or monkey bun, the market kids would introduce Joe as, "The guy who makes them". People were genuinely glad to see his face, they really had a chance to "Meet the producer". Next week, I think Jennifer Park is going. Folks who buy the danish pastries, flaxseed rye, sunflower rye or honey oatmeal bread, will be in luck. Today we're gonna make a new quickbread loaf. Banana bread with peanut butter and chocolate chunks. We're callin' it, "Nananutterchoco loaf". There's a baking site on facebook, probably not how you say that, but it's "Baking 101". The site is run by my very philosophical baker buddy, Dan Klecko. He posted the formula. I ran down the proper size chocolate chunks, last week. We've been doin' more with these tea bread/quickbread, type loaves. We've gone to a disposable baking mold, a nice crisp looking cellophane bag and a bow tied with Bennison ribbon. It's a sharp looking package, suitable for a small gift. We have them in various spots in the store and near both registers. Keeping with seasonal trends, we made zucchini bread this week. Blueberries are next, lemon poppy seed bread with blueberries and then peaches. This weekend, my daughter graduates from college in California. We are all going so we've decided to forgo the Wilmette farmer's market, this weekend. We will still be at GCM and Evanston. Those of you looking for flaxseed rye, we will have it this weekend at GCM. In fact, I think we are going to start having that loaf at every GCM. I think we will go to alternating sunflower rye and honey oatmeal. It's no surprise, people know what's good. Our flax rye has incredible flavour, and stays moist for a good while. We soak the flax seed in three times it's weight in water. It's really kinda creepy. It gets like aspic, or clear jello with flax seed. They really don't swell, the omit jelling properties. If they aren't soaked before they are added to the dough, the seeds will draw the moisture from the crumb of the loaf, resulting in a very dry loaf. I sometimes think we should reduce some of the rye flour that is "soured", and just add it to the final dough, 'cause man it can get pretty sour, 'specially in the summer. The sour should be held around 55'f, but we only have a small fridge that we hold at that temperature. The sour sits at room temperature, 'round 80'f I'm guessin', and it really gets going. Someday we'll have a grown up bakery. Gotta get goin' here, gotta get ahead on macaroons for the weekend. Yesterday it was lavender and vanilla. Today pistachio and red velvet. We increased the goods sent to the Saturday GCM by thirty five percent over the previous week. We made it until 11:10. The store was very busy Saturday. My buddy Chef Coppidge was here Saturday. The baker guys came and found me and said "A guy named Rich is at the back door". I went to the door and there he was. He said "I couldn't get in the store, they are lined up outside". We didn't do quite as well yesterday. I think the heat has chased everyone to the beach. I was in Hartigan's ice cream shop last night, they were busy. 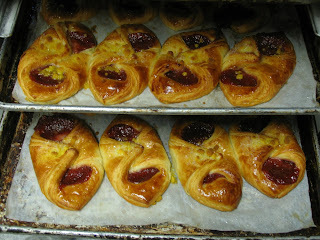 The rhubarb danish in the picture, is what we sent to the GCM, Saturday. We made a change to it. In the center, we piped a little cream cheese filling, under the streussel. I didn't taste them, but they sure look great. Next to pretzel rolls, I think danish was the second thing we sold out of. People know what's good. Matt got our farmer's market listings on our web page last Friday. Our plan is to list our offerings at each market. We're hoping this reduces any confusion/disappointment. This morning I will put up the list for the Wednesday GCM. Starters and soakers need to be prepared, starting this afternoon. Brioche, Danish and croissant doughs, will all be mixed this afternoon, laminated and/or shaped tomorrow, and baked early Wednesday morning. All the other breads, with the exception of baguette and ciabatta, will be shaped tomorrow and baked sometime Tuesday night. We use a spreadsheet that will be taped up on the proofer, this afternoon. Matt has been talking about going to a large, large monitor, instead of what we are doing. Interfacing it, with God knows what. I act like I understand him when he speaks. I struggle with makin' sure there is salt in every dough we mix. We are talking about using it for our nightly production list, as well. Can't tell you how many times a night you'll hear "Donde esta la $**# papel", means "Where is the freakin' list". The donut icer takes it to finish icing the donuts, the guy at the oven takes it to sort out the bread, the bench guy needs it to determine how many more baguettes to scale, and somebody will have it at the sink, tryin' to save it from a spilled cup of coffee. Oven timer is goin' off. I have an apple frangipan tart for 6am. I also have an overwhelming amount of office work for today. Seems I don't do any for two, three days, and I end up, a week behind. It's Friday morning, don't have a lot of time, but every once in a while, something catches my eye. Something that must be shared with those, less fortunate than the ones who find their way here to shop. 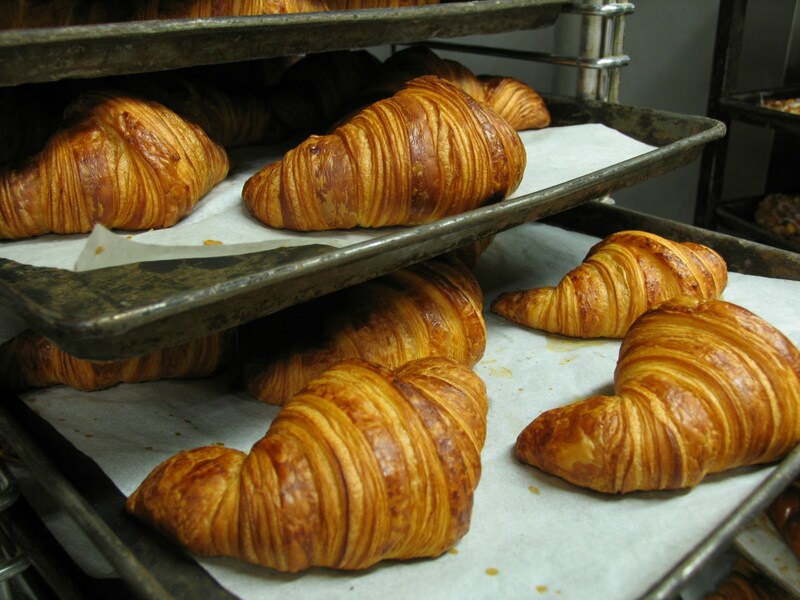 I'm not boasting, because I didn't make the croissants in the photo. Joe Falcinelli laminated the dough and a herd of others shaped 'em. Filemon baked 'em. To those in the middle of the country, they might say "They're to dark". To me, carmelized perfection. Toasty wheat notes, slightly sweet, and the need for a vacuum once you're finished eating. Philippe LeCorre told me once "In France, we don't eat croissants, we wear them". The every so slightly present crunch, as your teeth break thru several thin crispy layers on the outside, and an explosion of butter flavour on the inside. 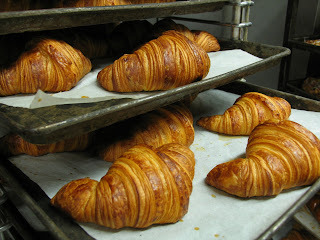 For the sake of knowing, we started laminating our croissant with Plugra butter, about four months ago. Makes all the difference in the world. If I had the ability to put more than one photo in a posting at a time, I would cut one open and show you, what I'm sure is incredible open structure, just like a spider web. Gotta get upstairs. We have an overwhelming amount of work today, weather will be nice tomorrow, markets will be cranked up. We also have loads of cakes for weekend parties. It appears graduation has begun. I need to take a break tomorrow around noon. Rich Coppidge, the bread instructor at the CIA, is in town for the restaurant show. I'm gonna treat him to oneadem Bat 17 sandwiches tomorrow. Noble Masi, the Noble Masi will be here Monday. It's Thursday morning, busy Wednesday market yesterday. The weather was perfect. As you can see in the photo, we had some beautiful strawberry/rhubarb danish. Needless to say we sold all of the danish and all of everything else. The market kids told me loads of folks came looking for our new sweet city loaf, I was glad to hear that. As unique as our bread is, nothing we offer at the market is as unique as that loaf. Carrots, onions, honey, flax, filberts and a hint of coriander, really tasty stuff. When Marc mixes it, he really pushes the hydration. I was helping the gang shape it on Tuesday afternoon, it was almost like shaping foam. It was really spongy. It had great structure after it was baked. I finally made some chocolate macaroons that I'm really proud of. It has taken me, literally, a good year. There was a Northwestern journalism student here yesterday, she is working on a story about macarons. She plans on making them herself. She watched me make a batch, and once they were out of the oven she said "Everyone speaks of how difficult they are to make, that was easy". I was really taken back. I explained to her that I've made hundreds of batches, Countless were unusable. Two or three of our culinary school graduates warned her, but she was unfazed. I'm expecting a call after the weekend. We ended up with a "Short" loaf of miche, from yesterday's bake. We sliced it this morning, if I must say myself, it is truly, very special stuff. We have been struggling with it. As I said before, organic flour is not balanced at the mill. One takes what one is given. Hydration rates and falling numbers, are all over the board. We are blending two different, high extraction flours, to create our loaf. we are down to fifty or sixty bags, won't be long and we will have to learn all over again. That's what keeps this business interesting. That, plus the fact that Hans picked up eight quarters of sliced miche yesterday, to satisfy his delivery route between here and the upper peninsula of Michigan. He has miche and rye bread stops along the way, and more importantly, one on the way back. On the way back he stops at some German butcher, north of Milwaukee. He brings back, absolutely the world's best summer sausage. He also gets landjaeger, little smoked sausages, that are joined at one end, and sold in pairs. He's coming back on Tuesday. I have just enough sausage left, to get thru the weekend. Funny thing happened yesterday. I was on my way home, in one of the delivery vans. They are pretty well covered with our name. I was sitting at a red light, second in line. I was in the center lane because there was a Metra bus in the right lane. The bus was stopped, and I looked to my right, thru the passenger side window, there was a young woman holding up a Bennison's bag, looking back at me. I waved, the light changed to green, and I still wonder what was in that bag. She looked like a cheese danish or sugar twist, type girl. Gotta get upstairs, I have pound cake in the oven and I can hear the oven timer ringing. The first call came from my son at GCM at 8:30, Saturday morning. The folks at the crepe stand needed more batter. Makin' it is easy, gettin' it down there, not so much. Fortunately I kinda had my wife on call Saturday. It was our first Saturday running three markets, I assumed we would need something run somewhere. I found her, and she came and got two more buckets of batter and off she went. She must have left here around 9:15. My son called again at 10:35, and they were done. The market was still goin', but we were done. When my wife came back, she said she never saw the market that crowded, except during the chef's bbq. They have expanded it to fifty four vendors. It is massive. A long way from what it used to be. On top of what we sold at the market, we sell the buns to Sunday dinner, that they use for their burgers they are grillin', we also had two hundred brioche buns for chef Stephanie Izard, who was grilling something at the market. The Evanston market had two loaves of bread left and we got back eighteen donuts and eight loaves of bread from the Wilmette market. Put that stuff in our store and it vaporized. It was a good day at the markets. No, a great day. Weather for Wednesday is most promising. Here in the store, we are brunin' thru macarons. I've been making two, three mixes a day. we're to the point, I think we can stop freezing them and start keeping them under refrigeration. We are turning them over that fast. I gotta say, they are really nice. It's one of those things, they are really nice, because the are being turned over. And they are being turned over because they are really nice. Thank you, Chicago magazine. I spoke to baker buddy/coupe teammate, chef William Leaman, Bakery Nouveau, Seattle, about caramel. We are making caramel macarons, really tasty stuff, however the caramel could be firmer. William suggested twenty percent milk chocolate, added to the caramel. while it's still warm. Viola! Sharp guy he is. Caramel, what could be better. Sugar, creme, butter and a little milk chocolate. We caramelize the sugar, add hot creme and melted butter, and a little chocolate at the end, my, my. It's somewhere between butterscotch candy, caramel corn and butterscotch ice cream topping. Reminds me of the days at the Dolton, Fourth of July carnival. While I was on the phone with William, he said I need to add pictures to my postings. Today is my first try. If you get a photo of Christmas morning at my house, or an eighth grade graduation, I apologize. I will get it figured out. Friday we took a picture of our maple bacon long johns, being held in a Bennison's midget tissue. That is the picture I am intending on posting. Figured I would cover a few things I've been talkin' 'bout. Gotta get started here. Actually been here for a few hours, sortin' thru the rubble. I have a conference call at 10:30, then it's off to the donut fryer for my final day. Don't know if I mentioned it, but we've had a night baker on vacation for the last two weeks. We've been limping along. Arturo returns Tuesday evening for the Wednesday bake. Jenny is in Philly, returns tomorrow. Vacations are done. I try to avoid anyone taking vacation time between Mother's day and Halloween, aka market season. Oh, Jenny's rhubarb danish Saturday, stellar. Be at GCM Wednesday morning. see for yourself. We started something new for this market season. Every Wednesday, one of us guys, involved with the production of the bread that gets sent to the market, will be at GCM from 7am to 10am. We are working on putting it on our website, titling it "Talk to the baker". People that shop at that market are very "Food savvy", they have loads of questions that can only be answered by someone who knows the production methods we use. A few times yesterday, folks asked "What do you have that is whole grain". simple as it sounds, it's a tough question to answer. All the product we make, is made from grain. Any bread with visible seeds has whole grain in it. I'm assuming they mean "What do make without white flour"? Of course that varies from market to market, day to day. We always try to have our cracked wheat bread on the table. Another reason I went to the market, is to line up suppliers for ingredients we purchase, from the market. Yesterday, I bought some beautiful rhubarb. We will be cooking it into strawberry rhubarb jam, for our GCM danish filling, that we will fill pastries with, for the next few weeks. The strawberries we will use, have been in our freezer since last July, that we also bought at the market. Strawberry rhubarb is one of my favorite flavour combination's. We did a strawberry rhubarb brioche in Paris for the Coupe. my year. It was the only flavour combination that I used from the onset of my road to the Coupe. I used it in regionals and nationals. Of course, it evolved over the process, but the flavour combo remained the same. This weekend we will be making a diamond shaped pastry with the filling we cook. Jenifer will be making them. She does a great job with her lamination work. I'm sure the pastries will be breathtaking. Weather will be nice, she better roll up her sleeves. Yesterday, at the market we unveiled our new "Midget tissue". Midget tissue is what every bakery uses, in their retail store to pick up product, at the time of sale. The new stuff, is covered with our logo. Our retail kids use it to pick up pastries or line small boxes, when weighing cookies. John Roeser taught me the importance of having your packaging stuff printed. EVERYTHING we use, has our logo on it. Took us years to get it done. We did our boxes first, then bags, then moved on to our coffee cups. Now finally, our midget tissue. I had to buy a two year supply. But it only make sense to me. More customers walk here, than drive. The world has become more "Green" conscious. Many, many customers will say "I don't need a bag". So they would walk down the street, holding an eclair in a plain white tissue. Now when they are riding the train, eating our pastry, drinking brand X coffee, people will still see our name. Same with folks walkin' around the markets, eating a croissant. I was a little embarrassed yesterday. The tissue is packed in little square boxes. Turned out the boxes we took to the market were from the first case of boxes we opened, when the tissue was delivered. The boxes had my tear stains on them. This tissue is one of the coolest things I've ever seen. Gotta get upstairs, macaron case is empty. Sold a boat load yesterday. I didn't make any yesterday, so I'm way behind. I need to make two mixes a day, to keep up. Means, I need to make four mixes today, to catch up. Plan for today is chocolate, lemon, caramel and strawberry. How much fun is that? I love makin' macarons. Pourin' here, gonna be tough to keep a crust on the baguettes today. A new high, and low. Yesterday being Mother's Day, turned out to be more than I remember. I made some good notes for next year. We got pasted. I've been in bakeries that were being auctioned off, that had more product in them, than we did, yesterday at closing. What is purchased here today, will be fresh, guaranteed! The low side is how long people had to wait in line. Our bakery occupies two store fronts. We are on the southwest corner of the intersection. We also occupy the space to the west of the corner. In the store window of that space, is where we do all the cake decorating. There is a set of steps there for kids to stand on and watch. We also have a security system monitor in there so the cake folks can find someone they need to speak to, inside the bakery. A few of the cameras are located in our store. Around 8:15 yesterday, I was in there decorating a cake. I happened to catch a glimpse of the monitor, and I noticed loads of customers in the store. I stepped back and noticed the store door was being held open by the line. I leaned forward over the decorating table, which is in the window, and looked east. I could see the end of the line, well outside the building. It was a very overwhelming experience. This was the fourth time I've seen people waiting outside. Two of the four were on a Fat Tuesday, and once on a more recent Saturday morning. But never as long of a line, as yesterday. There is a relatively new program on Sunday nights, on WGN TV. It is called "Chicago's best". Every week, the show has a title and/or theme. Last night they previewed three sandwich spots in the Chicago area. One of them was Bat 17, here in Evanston. Matt has put up a link to the story on our website, on the bread page. Turns out that Bat 17 is a customer of ours. They have bough their bread from us, since they opened. They really do make incredible sandwiches. They are not inexpensive, but worth every cent. They made reference to our bread three times during the four minute spot. Jim and Jim, really take care of their business. One of them is always there. They deserve all the praise they get. To bad they didn't mention their burgers, they are the real highpoint of the menu. A ten ounce patty on a high crown brioche bun, badass, straight up. The power of advertising is unmeasurable. Since the story about our macarons broke in Chicago magazine, it's been nonstop. We make 'em everyday. I made several mixes last Thursday and Friday, so I wouldn't have to make any Saturday or Sunday. I got by today as well, but I won't be so lucky tomorrow. We just put together our alleged production list for tomorrow. opening day at GCM is Wednesday. Should go out and yuck it up tonight, winter break is over. Tomorrow we start working like men again. It's Saturday afternoon, and as typical I must wait until 4pm, so i can deliver our only wedding cake this weekend. Been a crazy, crazy day. Incredibly busy, I think we filled our macaron case three times today, and it's only 3pm. Markets didn't do so well today. It was bitter cold and windy. Funny enough both the Wilmette and the Evanston market are maybe five blocks from the lake. Close enough to catch breezes off the lake. The Green City Market is right on the lake in Lincoln Park. Hopefully by Wednesday things warm up. Poor Colleen came back to the bakery at noon today, her hands were beet red. 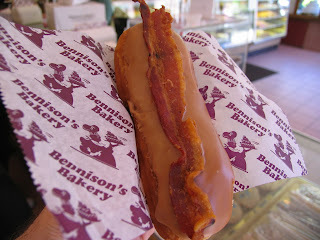 Last weekend in Minneapolis, over baker's, dinner conversation, a new donut idea came up, Maple, bacon, donuts. What? Jeremy from Seattle said they make 'em at Voodoo Donuts in Portland, Oregon. So, this week, we gave it a shot. We took yeasted long johns, iced them with maple donut icing. While the icing was still tacky, we laid a strip of crisp cooked bacon, on top. Kinda strange lookin' at first, but really delicious. We made a dozen on Wednesday, sold 'em all. The city of Evanston guys, that are here everyday,bought a couple. They came back on Thursday lookin' for more. We explained to 'em that we needed to pull the bacon out of our freezer a day ahead of time, so we didn't make any Thursday. We made another two dozen on Saturday morning, gone immediately. "Bout the middle of the week we're gonna start again. Oh, another thing I learned at Turtle Bread in Minneapolis, instead of "Store girl" or "Store personnel", we're going to start using "Retail kids". The retail kids asked once or twice, "How many bacon long johns did you make"?, Mark replied "Two dozen". All we heard was "Gotta double it next week". One trick we discovered, by dumb luck, we cook our bacon in the oven on a drip screen. So it's nice and dry of bacon drippings. Really adheres to the donut well. We've been roasting our bacon for our egg sandwiches on the weekend. As my dad would say "Even a blind squirrel finds an acorn once in a while". Day is done, it's time to load up this cake and get on the road. We're gonna start pretty early tonite, got alot of stuff for tomorrow. 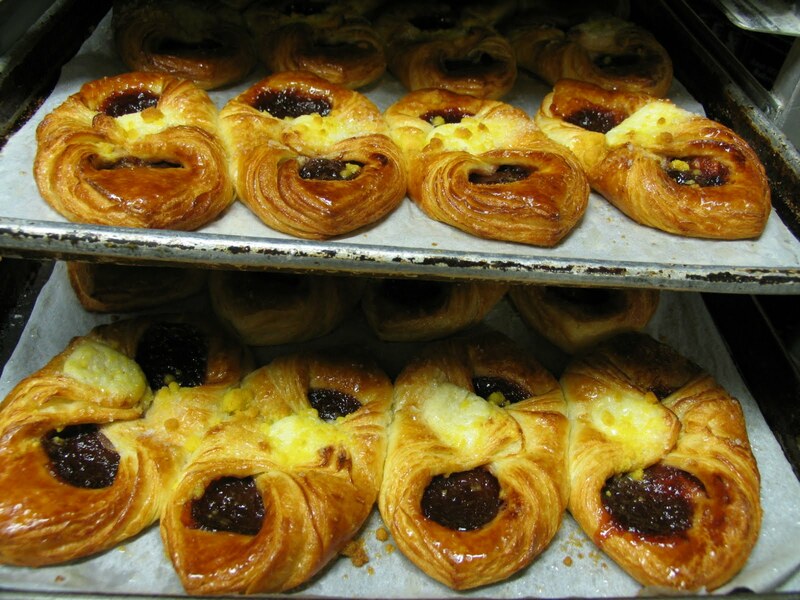 We'll be busy in the store, and a few country clubs we bake for, want mini breakfast pastry items for their Mother's Day brunch. We have one night baker coming off vacation this Sunday, and another going to be off for a week. it's important that we get our guys vacation time off, finished before the market season really heats up. I made it back to the bakery Sunday night around 10pm. Things look like they do, after a busy weekend. Things were hectic here on Saturday, Wilmette market did well, lots of communion cakes. The Wilmette market sold out of pastries, as usual, had some bread left. Sold loads and loads of macarons, here in the store. French macarons are always best after they set in a fridge overnight and then frozen. I had made a lot, before I left, we're empty. Gonna hit it hard today. Over the weekend, I received word that both Jennifer Park and Joe Falcinelli passed the Certified Journey Baker exam. They took it here a few weeks ago. Jennifer and Joe are both journey bakers here. The title "CJB", is the first step to becoming a CMB. After a few years more experience, they will test for the "Certified Baker" level, the second level on the way to master. The CJB level involves a study guide and written test, not really a big deal. But it is a big deal, to me the thing that it exposes is a persons' desire to improve their knowledge and ability. It tells me that the bakery where certified people are employed, is concerned about the quality of their wares and perception of their business. We flaunt it here at Bennison's, I make it known to our customers that folks here preparing our goods, are certified to the highest standards as the American baking industry dictates. This past weekend in Minneapolis. we made some real progress in the viennoiserie category. I learned a lot myself. At this point I learn small things, endless small things. I heard Jeff Hamelman tell his class, on their first day "In the next five days I will teach one hundred big things about baking. Should you choose, you'll spend the entire rest of your life learning the little things". In Minneapolis we made brioche a tete, a very traditional French thing. Takes loads of time, so nobody really does it, in a profit seeking situation. I've had limited experience with this shape. So we tried a few different ways of creating the round ball with the smaller ball on top. Awesome, just freakin' awesome. Some of the nicest brioche a tete I've ever seen. I was so excited. We are also working on two other laminated pastries and one non laminated. Takes a long time, pick out the shape, get a mold made, balance the flavours, get it done in eight hours and schedule it in the oven around the artistic baker. For the LeSaffre Cup, the pastry guy has to do seven products. This competition stuff, is for the young. Gotta get upstairs. got o couple of those little things to learn today, regarding chocolate macaroons. Thank God it never stops. Saturday morning, sitting in the Culinary Centre here at GM. The windows of the kitchen face east, and the sky is perfect blue, and we are watching the sun rise up over the distant downtown skyline, very cool. I understand it's warm and dry back home, great for the farmer's market. I also understand that we have a lot of cakes for this weekend, sure to create a lot of tension this afternoon. Yesterday's practice was very good. Folks who haven't been thru getting ready for the Coupe, really don't understand this is a long, long, hard process. Every year it gets harder and harder to do things that haven't been done before. It's tough to create products that bake nice in a unit that weighs under one hundred grams and the same shape piece to bake nice, in a three hundred gram unit. On top of that you need to do five different doughs, create seven different products, finish in eight hours, meet your weights and keep clean. Very stressful. Jeremy did a great job yesterday, it's only his second practice. He had two pieces I thought tasted great. One large piece of criteria. He didn't do much finishing of his pieces, but that's ok. All in time, I don't want him to get discouraged. Many have walked before him, we weren't any further along than he is, at this point. Folks walk in here, at the end of his day, and say "This is it? This is what there is after eight hours?". Be there in September, in Vegas, pass judgment on what is presented at that moment. Take a look at what the judges see at the end of his eight hour bake there. That is what really matters. Last night Harvey McLain hosted a huge party for the guild at his bakery, Turtle Bread. Helluva nice guy, always very giving to the guild, a great supporter of the NBC, in it's day. Harvey is not a baker, he's a corporate guy. He has Solveig Tofte running his bakery. Solveig was the bread baker on the 2008 team. Right now she is very active with the team that we are getting ready, she also sits on the board of the guild. Nice bakery, nice product. In the same building. they have a fine dining restaurant plus a wood fired pizza oven, with seating. Quite an operation. Lots of baker friends turned out, lots of GM folks. Bakers exercise unmatched fellowship. We all know what each other goes thru. It's really tough being a producer and a retailer, especially dealing with a hand made product that relies on the elements of nature, and has a limited shelf life. We are very unique. Gotta check on Jeremy, make sure he's on task. I see he's rounding brioche dough. He has to produce twenty, traditional brioche au tete, plus twenty braided brioche. They all must weight between forty and a hundred grams. But, whatever one weighs, they all have to weigh. Godspeed.